Despite the pouring rain we had planned to visit a Ploughing Match just outside Bransgore this morning. I thought it might be a good photo opportunity. Unfortunately the ground was too muddy and slippery either for Jackie to park the Modus, or for me to risk slipping over. We continued on to Ringwood hoping to buy a wedding album for Becky and Ian. Wessex Photo didn’t have one in stock but have ordered some samples for us to look at. We took the opportunity of brunching at Café Aroma. 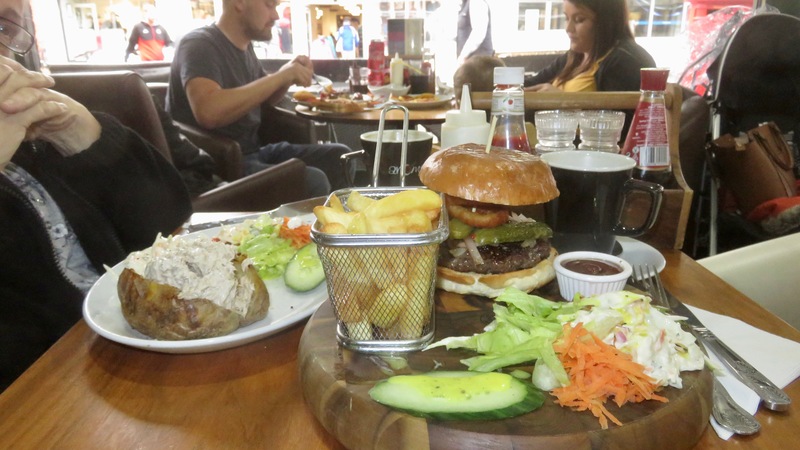 Even there, my gourmet burger was served on a lump of wood with chips delivered in a miniature supermarket trolley which had lost its wheels. Jackie’s choice was jacket potato with tuna and mayonnaise filling. She felt fortunate to have a plate. This afternoon I printed a complete set of A4 size photos taken by me and by Miche. In deference to parental wishes, no images of Poppy were included in yesterday’s post, but there are quite a few for Mr and Mrs Steele. Elizabeth returned this evening from a couple of days at Mum’s. The three of us dined on Hordle Chinese Take Away fare. Jackie drank Hoegaarden. My sister and I drank Albali Reserva 2012. This entry was posted in Uncategorized and tagged Café Aroma, Wessex photo by derrickjknight. Bookmark the permalink. That’s a serious looking burger!! 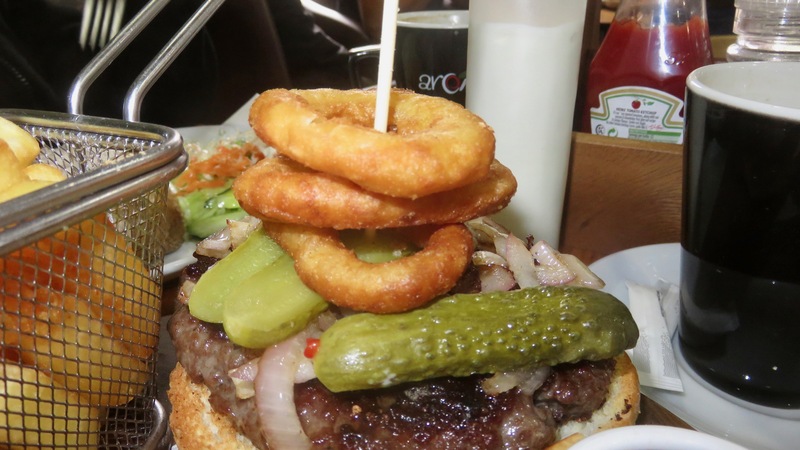 I’ve heard of a finger supper, but that burger looks like a two-handed lunch! Did you start from the top and work down? Wow! Doesn’t that make me hungry early in the morning? We are getting hard rains tonight and they say it will rain again tomorrow. There are a lot of companies out there, wouldn’t it be cheaper for you to order an album yourself on-line. Amazon isn’t the only company and it’s usually the most expensive. That gourmet burger looks delicious! A wedding album is a good choice for the happy couple. Also, your food choices were excellent, and elicited many an envious sigh! Wow–those lunches! I haven’t seen the wood as plate trend here, but I did see some delicious looking french fries (chips) in a fryer basket like that yesterday. I’m sure the photo album with your wonderful photos will be an excellent and appreciated gift. Nice lunch! I need to go back a few days and see what I missed!